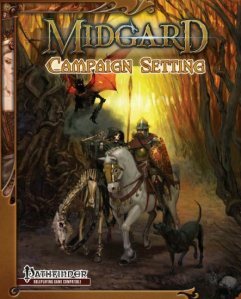 And so onto Part 3 of my review of the Midgard Campaign Setting. (You can find the previous posts here and here). This time, we cover Chapters 5 and 6. These are, at least to my reading so far, possibly the most interesting regions, and certainly are a twist on standard fantasy fare. What are you waiting for then, climb aboard the wagon, this caravan is heading south! When the chapter begins with a full page image like the one shown on the right, what’s not to like! An evocative image, and certainly one which leads you straight into the main flavour of the region: an eastern empire with the taste of decadent Persia or Arabia, with the added pungent spice of dragons, sprinkled liberally! The Mharoti Dragon Empire is an empire literally ruled by a cabal of ancient dragons, where the nobility is made up of lesser dragons, drake and dragonkin (Midgard’s equivalent I guess to 4E dragon born), and humans and other ‘normal’ D&D races are subservient. The exception of course, is the (current) Sultana, a human with dragon-blood, who is allowed to rule because its a chore the draconic overlords would rather not bother with! All this makes for a land teeming with adventure possibilities. Dragons of course, always want more treasure, so the Mharoti is necessarily an aggressive expansionist empire, with lots of hooks for military style campaigns. There is a side-bar describing a typical Mharoti army, made of all sorts of fantastic sounding troop types, including dragonkin cavalry, elementalists and fire dragons. Great stuff, which makes me want to break out the wargaming table, let alone run an RPG! The chapter provides an in-depth description of the various ‘castes’, from the lowly humans, dwarves etc, to the citizen kobolds and dragonkin all the way to the eight Morza, the original ancient dragon lords. Each of these is described alongside the province they rule, as well as a section on the capital of Harkesh. Lots of material here for political intrigue-based adventures. Keeping with the exotic, the chapter rounds out with some crunch: strange trade goods found in bazaars, magic items and curiosities, and a section on Dragon Magic. If the inspiration for Chapter 5 is the eastern lands of history and fable, then Chapter 6 is straight out of Machiavellian Renaissance Italy! Centred on a large peninsula jutting out into Midgard’s inner sea, the region presents seven distinct city states, bound together by geography, shared history – and of course, war and intrigue!! In the Seven Cities, war is portrayed as a religious requirement; most of the cities pay homage to Mavros the God of War. The chapter starts off with a whole section on the regional approach to war, bound by many rules and customs, which prevent wholesale destruction, and is mainly aimed at raising the ‘status’ of generals and captains, making fortunes for the mercenary companies who are the main protagonists, and finally of course, wringing some political concession out of the enemy. The remainder of the chapter covers the city-states themselves, each of which has a distinctive style: from the self-styled Imperial Valera, to the druidic Duchy of Verrayne guarding against the western wastes; from the Oracle-ruled state of Kammae Straboli to the maritime power of Triolo, and others besides. This is a mainly human area, but also has a significant population of minotaurs, including a whole island ruled by them. I found these two chapters a great read – they are so full of ideas and twists on historical and fantasy sources, that my mind was racing as I read, thinking of adventures, or planning how I might steal ideas for my own campaign – and that is surely the main goal of a campaign setting! Next, prepare for the journey to turn rather weird, as we head to the Western Wastes and beyond. Yeah, that omission of the whole chapter in the contents page frazzled my brain a bit. I hope that sub-editor was whipped with strawberries and cream. Thanks for the review. I look forward to your views on the other chapters. Just came across your 3-part review, nicely done. My interest level has now gone from “It sounds pretty cool, but I’m not sure” to “Dammit, so do I buy this or 13th Age first!”.